Each Riecken Community Library is built with exciting potential. New opportunities yet to be realized – made possible with access to information resources. Decorated to reflect the culture and personality of the community, the library grows into a thriving center for reading and other learning activities, local-interest programs and community assemblies of all kinds. Riecken librarians are immersed in intensive professional training. In addition to guidance on children’s programming and outreach, they learn how to proactively address the needs of their library users. As a result, Riecken Community Libraries are filled with people, colors, sounds and action. Riecken Community Libraries are many things to many people – with an average of over 800 visitors per month per library. Our key areas of library focus are explained below. 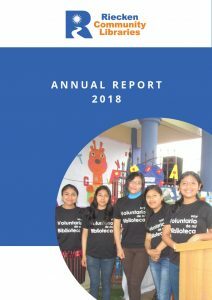 And if you want to read in more detail, our 2014 Annual Report offers examples and personal stories about some of these initiatives and programs. Help bridge the digital divide in Central America. Deliver dynamic programming for people of all ages. Build local leadership skills, including development of youth leaders. Riecken Community Libraries help bridge the digital divide in Central America. Imagine not having access to computers or the Internet. If you are reading this online, it is probably unthinkable. In the communities we serve, a Riecken Community Library often provides the first – and only — hands-on experience with a computer. Our library users gain new skills and become linked to each other, to ideas and to opportunities – powerful tools for improving their communities and strengthening their participation in the bigger world. Where Internet is available, users can be found performing research, joining the world of online commerce, blogging and distance learning. The Riecken Network, a Web-based portal available to those libraries with Internet, links our libraries electronically to share ideas and help one another solve problems. Our technology program activities include practical computer and Internet courses, and the use of software especially aimed at young people. Teachers in some Riecken libraries are trained in effective use of social networking and implementation of educational platforms including Khan Academy and WebQuest, while adhering to the Ministry of Education National Basic Curriculum standards. Providing Internet services, badly needed replacements for outdated or broken computer equipment, and technology training for our librarians are on-going and costly. Your contributions are critical to making free access to computing and the Internet available in all of our libraries. Riecken Community Libraries deliver dynamic programming for people of all ages. Riecken libraries are more than shelves of books with tables and chairs – they are created to encourage visitors to explore their world through reading, class participation and training, research, games and learning from each other. Librarians and volunteer staff inspire use of the library’s resources with network-wide programs and story hours designed that instill a lifelong love of reading, and early childhood development classes. To help reduce severe educational deficiencies, Riecken Community Libraries’ influence goes beyond their own walls with mobile libraries. We provide resources, complementary programs and training to area schools and teachers to help improve the quality of local education. Trainings on the introduction of technology in the classroom and dynamic techniques for teaching reading have shown measurable results: Teachers are seeing the school performance of their students improve in math and Spanish. When possible, our libraries provide access to information to those previously excluded by distance, even creating mobile libraries run by young people to promote the importance of storytelling and reading. Your support for Riecken Community Libraries helps provide critical librarian training, enables the replacement of old and outdated book collections, and funds the creation and delivery of new programs to meet on-going needs in the community. Riecken Community Libraries build local leadership skills, including development of youth leaders. Riecken Community Libraries play a strong role in building Central America’s future. All Riecken libraries have local boards consisting of members of the community that develop mission statements, hold elections and establish library policies. They gain financial literacy, public speaking opportunities, and negotiating experience – backed by a deep understanding of the value of partnership. These are high-value skills, especially for those in poor rural communities in a developing country. Illustrating the maturation of the Riecken Community Library leadership, the Library Networks in Honduras and more recently, in Guatemala, have established formal associations bringing libraries’ leadership together annually for governance/Policy-making/Other objective? In this region where gang activity is on the rise, the libraries’ youth groups have won accolades for giving rural teens positive choices and activities, creating a disincentive for gang involvement. Youth programming such as tutoring mentoring of younger children and cultural events, engages youth with alternatives to the violent realities they face daily. Riecken Community Libraries facilitate community development. We believe that informed societies are stronger, healthier societies. Riecken Libraries support belief by offering safe and non-partisan gathering places where democratic values and exchanges can be held. Libraries host forums, planning meetings, conferences where NGOs explain their missions and services, and a place where issues of governance can be addressed. Wherever libraries are located, there is growing attention paid to the role, behavior and accountability of public institutions. The partnership inherent in the Riecken Community Library Model demonstrates democratic and civil values such as transparency – an example of which is the “Transparency Corner” inside every Riecken library where the facility’s financial accounts are posted and visible to all visitors. Riecken Community Libraries promote healthy communities – offering maternal and child health programs, and special classes and discussion on women’s health and non-violent problem solving. In Guatemala, Riecken Community Libraries help rural entrepreneurs become part of the global economy, promoting local initiatives for social entrepreneurship, and the active participation of women in community development processes. Of course, no Riecken Community Library even gets started without a team of volunteers. The Riecken Community Library Network has 6400 volunteers including nearly 500 volunteer board members that supplement paid staff and perform crucial functions as reading promoters, course instructors and facilitators. In 2014, the approximate USD value of volunteer hours exceeded $325,000. With the library such a high value asset for the community, Riecken volunteers exemplify committed individual contribution to community development.